Another piece in the puzzle to find out what dark matter is. For years, a galaxy named Dragonfly 44 remained unnoticed despite its relative proximity to us here in the Milky Way. This wasn’t surprising, seeing as this galaxy is very dim. Last year, astronomers finally gave it the attention it deserves—and rightly so. The reason why Dragonfly 44 was dim was because it had very few stars, making it very easy to miss. 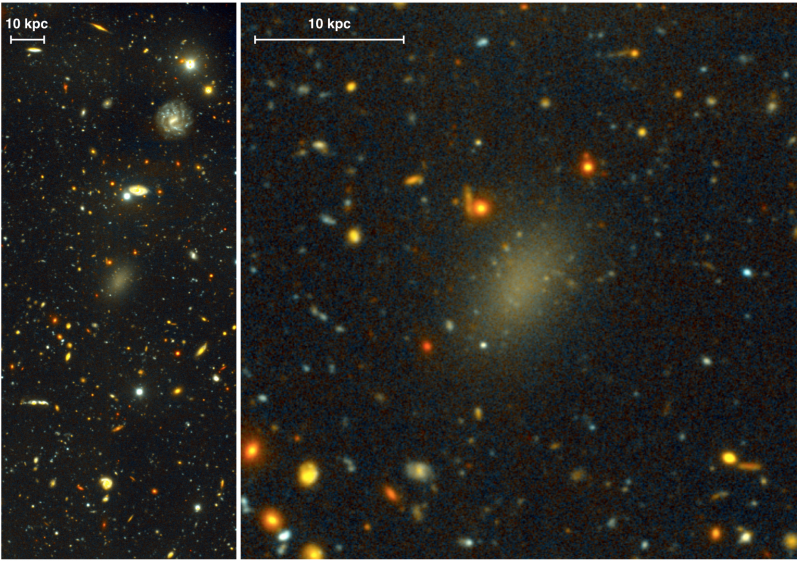 An observation of the Coma Cluster by the Dragonfly Telephoto Array led to astronomers finally seeing that there was, in fact, a galaxy hiding out there in the expanse. At first, the lack of stars did strike astronomers as odd. But upon contemplation, its ability to even keep these stars at all was far more strange and interesting than the former mystery. Why? Sparse galaxies like Dragonfly 44, called Ultra Diffuse Galaxies (UDGs), have so few stars that normal assumption would dictate these galaxies easily losing the stars they have. Without enough mass in the galaxy to generate the gravitational attraction to keep the galaxy together, these stars could easily spin out of place (and maybe even be kidnapped by neighboring gravitational forces). The galaxy being able to keep these stars in place despite the lack of visible mass implies one thing: dark matter is the missing link keeping them together. Dragonfly 44 was particularly astonishing: it stretches 60,000 light years across, and only .01% of it comes in the form of stars and normal matter, which would mean the remaining 99.99% is dark matter. A galaxy made up almost entirely of dark matter was unexpected, and astronomers do not have an explanation on how they form yet. But this finding is a significant aid in the quest to unmask what dark matter actually is.